And by way of magic time travelling and technology, we’re back in Sydney folks! Did you even feel that? The transportation was so smooth! First you were here, now you are here! Do you feel the difference? A quick blast to the past will work wonders on your youthfulness. I’ve miraculously zapped you back to the Easter holidays. Thank you. No need for applause. Today, I bring to you the delights of District Dining. The more casual and relaxed restaurant by Warren Turnbull, whose fine dining restaurant Assiette I visited earlier in the year, in extreme conditions of heat! We arrived a tad early and there were no tables available. We were given a choice to either order drinks and wait around at the balcony area or come back a bit later. We chose the latter. When we came back 15 minutes later, we were seated and introduced to the menu and cocktail specials on the board. I saw that there was lychee martini on offer and excitedly ordered one for myself. It arrived in a beautiful big martini glass with a tiny piece of lychee. Not one lychee, but one quarter of a lychee. For $15, I would have liked a whole lychee to be included with my drink. Not wanting that to spoil my expectations for the dinner ahead, I pushed the feeling that I had somehow been cheated to a deep corner of my mind. It didn’t take long for the 3 of us to decide on our order. The menu is designed to share, which was great for us as we were planning to do just that. 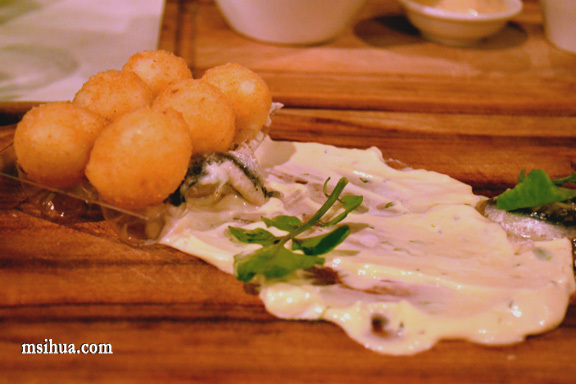 For the starters, we began with Crispy Quail Eggs, Tarragon Mayonnaise & White Anchovies $16. Wonderfully rich, the quail eggs were partnered well with the sharpness and acidity of the mayo and anchovies. Next up on our table was the beautifully crafted Cured Kingfish, Wasabi Pannacotta, Soy Bean and Ginger Marmalade $18. All 3 of us thought the same thing. 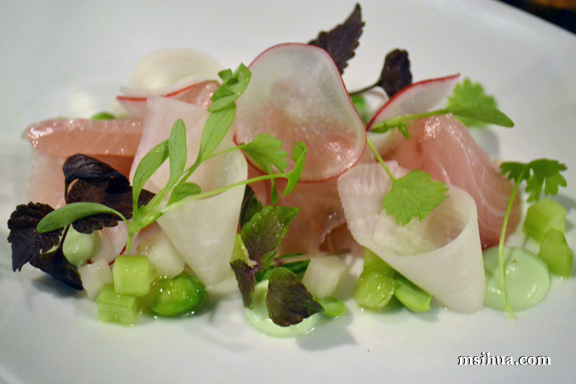 The fish was really fresh and beautifully paired with each element on the dish. The wasabi pannacotta was really light in taste. 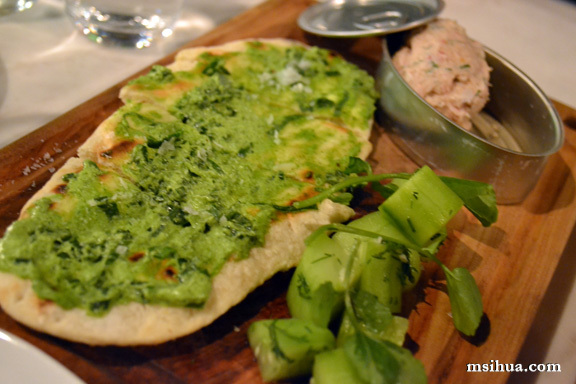 The Smoked Eel Pate, Cucumber and Green Onion Flatbread $16 was the definite favourite and winner of the night. The eel had such a wonderful smoky aroma that made it perform really well as a pate. It tasted delicious! 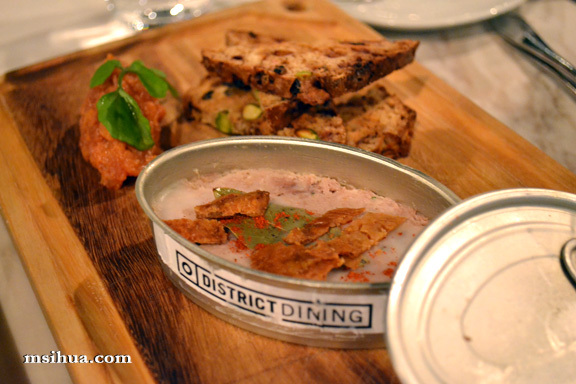 Big Sis and I really wanted to try the Duck Rillette, Persimmon Chutney and Persimmon Toast $18. I really felt warmed by the persimmon toast. The most amazing part of the rillette? The crispy and crunchy texture of the duck crackling that was right at the top. District Dining Crispy Chicken, Coleslaw and Lime Chilli Aioli $20 was a bit of a disappointment for me. It wasn’t as crispy as I expected it to be. I wondered if the chicken had been sitting for a while prior to being served to us. It looked good until you bit excitedly into it. The crispiness promised to me just wasn’t there. It needed that *crunch* factor when you bite into it. Instead, it was akin to flat batter. Not soggy, just flat. The chicken encased in that batter however, was creamy, tender and well seasoned. Coleslaw and aioli were superb and went well with the chicken. 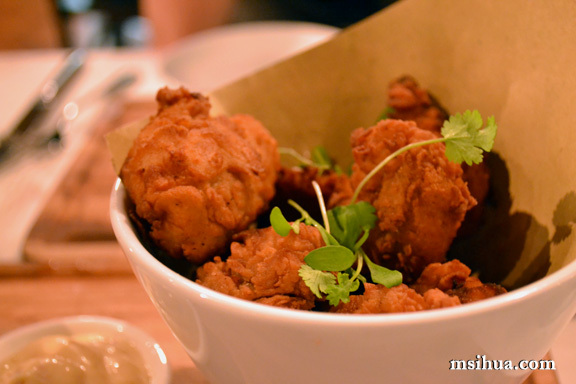 However, what the Crispy Chicken lacked, the Crispy School Prawns with Chilli Lime Mayo $15 did not. Where the chicken was flat, the prawns were crispy. 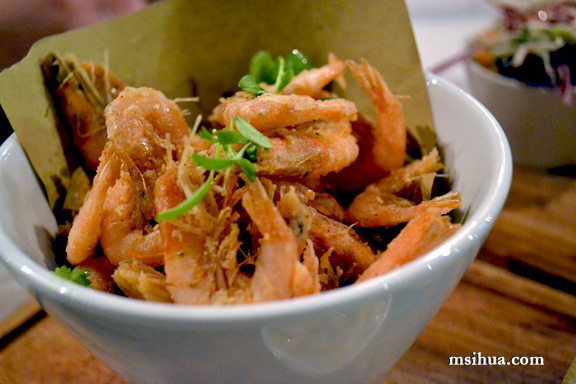 Where the chicken lacked crunch, the prawns were snapping! By this stage, all 3 of us were completely full and could eat no more. Which was a pity, because I really wanted to try desserts! What we decided to do instead was to take it easy and not overindulge and spoil our otherwise fantastic meal. We decided to end on a high note. A floral chocolatey note. What did I think of the overall experience? Well remember at the beginning, I was feeling a tad cheated by my sad piece of lychee? By the end of the night, I had all but forgotten about it. 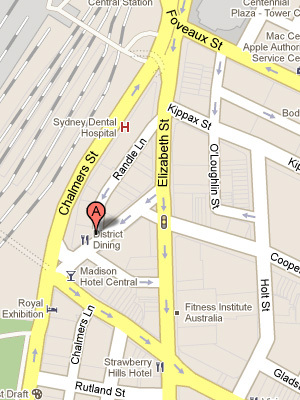 I was happy with the service, the atmosphere and the quality of the food. 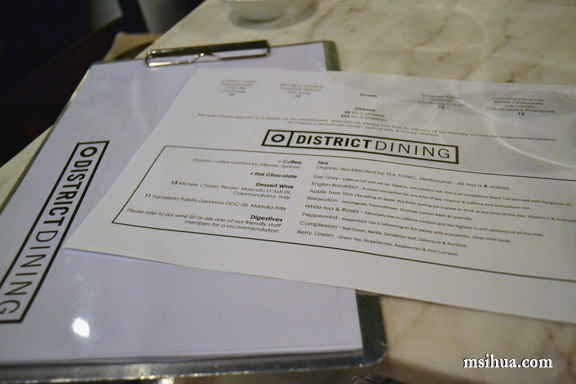 District Dining’s concept of sharing food allows for better chemistry among diners at the table. Would I come back? Yes, if I am in the area. 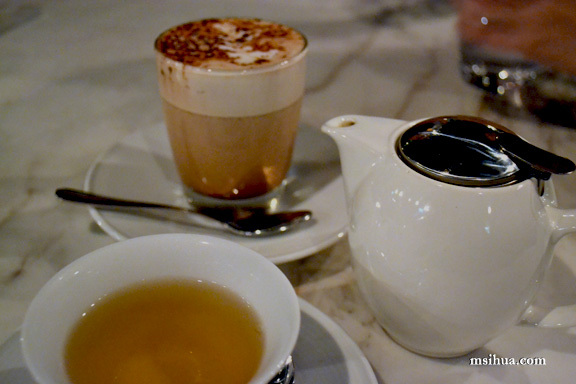 I love to visit Sydney at least once a year…. this looks like a great place to go when I am next up. It’s worth the visit if you have the time! Hang on a sec… I wasn’t in Sydney in the Easter holidays! I’m confused! Also… a quarter of a lychee? Seriously? Yeesh. The quail eggs look great and I love how everything is presented. Thanks Susan! The presentations are very cute!